Sona College of Technology, Salem has advertised for recruitment of Professor / Associate Professor Plus Non-Faculty jobs vacancies. Interested and eligible job aspirants are requested to apply within 10 days from 05th December 2018. Check out further more details below. About College: Sona College of Technology has achieved global identity through its involvement in research in recent technology and successful completion of projects and products. The college is known for its rich tradition and high values bestowed upon by its Founder Chairman, Thiru. M.S. Chockalingam. The “AICTE – CII Award for Best Industry – Linked Technical Institute in India – 2013” bestowed on Sona among 1050 survey participants and 37 short-listed institutions stands testimony to the commitment of the college to impart quality education. As per AICTE norms. 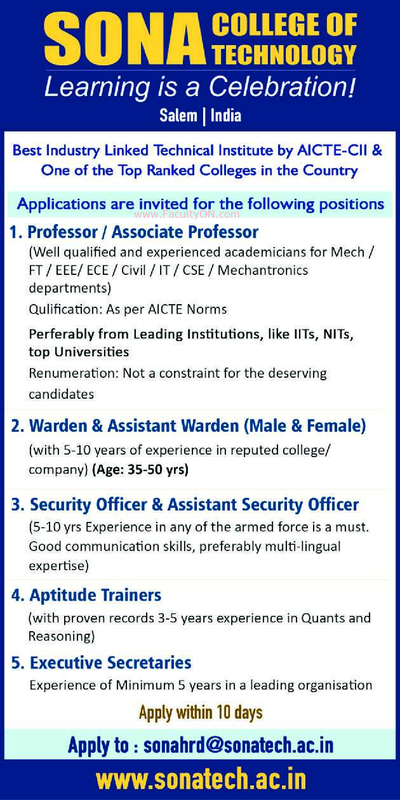 Candidates from IITs / NITs / Top Universities will be preferred.